Why is the nation’s flagship loan forgiveness program failing the people it’s supposed to help? When Leigh McIlvaine first learned that her student loan debt could be forgiven, she was thrilled. In 2008, at age 27, she’d earned a master’s degree in urban and regional planning from the University of Minnesota. She’d accrued just under $70,000 in debt, though she wasn’t too worried—that’s what it took to invest in her future. But graduating at the height of the recession, she found that the kind of decent-paying public-sector job she’d anticipated pursuing was suddenly closed off by budget and hiring freezes. She landed a gig at a nonprofit in Washington, DC, earning a $46,000 salary. Still, she was happy to live on that amount if it was the cost of doing the work she believed in. At the time, she paid about $350 each month to stay in a decrepit house with several roommates, more than $100 for utilities, and $60 for her cellphone bill. On top of that, her loan bill averaged about $850 per month. “Rent was hard enough to come up with,” she recalled. Then one day while researching her options, she read about something called the Public Service Loan Forgiveness (PSLF) plan. At the time, Congress had just come up with a couple of options for borrowers with federal loans. They could get on an income-based repayment plan and have their student loans expunged after 25 years. Or, for borrowers working public service jobs—as social workers, nurses, nonprofit employees—there was another possibility: They could have their debt forgiven after making 10 years’ worth of on-time payments. The PSLF program, backed in the Senate by Ted Kennedy and signed into law by President George W. Bush in 2007, was the first of its kind, and when people talk about “student loan forgiveness,” they’re usually talking about PSLF. It was implemented to address low salaries in public service jobs, where costly degrees are the price of entry but wages often aren’t high enough to pay down debts. A Congressional Budget Office report last year found that public-sector workers with a professional degree or doctorate earn 24 percent less than they would in the private sector. In Massachusetts, a public defender in 2014 made just $40,000, only about $1,000 more than the court’s janitor. Meanwhile, 85 percent of public-interest attorneys in 2015 owed at least $50,000 in federal student loans, according to one study. More than half owed at least $100,000. According to a 2012 study, 65 percent of newly hired nonprofit workers had student debt, and 30 percent owed more than $50,000. In order to keep people working as public defenders, or rural doctors or human rights activists, something had to be done. PSLF was an attempt at a fix. Several companies, including one called FedLoan Servicing, contracted with the Education Department to handle loan repayment, and until 2012, when the government assigned all PSLF accounts to FedLoan, borrowers had to keep track of their progress toward forgiveness. At the time she began paying into the program, McIlvaine wasn’t too perturbed that there was no official way to confirm her enrollment, no email or letter that said she had been “accepted.” She trusted the Education Department to run the program effectively and followed its parameters, taking care to send in the yearly tax forms that proved her eligibility and always submitting her payments on time. McIlvaine initially hoped these problems were just “hiccups,” but they kept piling up. And when she tried to figure out what was going on, she says, FedLoan’s call center “loan counselors” brushed the whole thing off as an inconsequential administrative oversight. Astonishingly, the cycle would repeat over the next four years. Despite these frustrations, McIlvaine kept diligently sending in her checks. In January 2016, she took advantage of a new program introduced by President Barack Obama that helped lower her monthly bill, and when she did, her loans were again inexplicably put into forbearance. On top of that, four months later, as she was trying to save for her wedding, FedLoan sent her a bill for $1,600, more than $1,300 above her monthly payment amount. When she phoned the company in a panic, they told her the bill was an administrative glitch and said not to worry about it; they’d sort it out. Warily, she accepted—after all, there wasn’t much else she could do. In August 2016, McIlvaine was offered a job at Mercy Corps, a nonprofit in Portland, Oregon, which came with a $10,000 raise and great benefits—the extra security she believed would allow her to start a family. But Mercy Corps required a credit check, and McIlvaine discovered that FedLoan had never actually dealt with that $1,600 bill, instead reporting it as 90 days past due and plunging her previously excellent credit score to an abysmal 550. When she called FedLoan in tears, she recalls, she was treated dismissively and told to “pay more attention” to her loans—and again the only option offered to her was to take an administrative forbearance while the company sorted out the issue. Ultimately she got the job, but only after she lodged a formal complaint with the Consumer Financial Protection Bureau, the watchdog agency created during the Obama era, which prompted FedLoan to send her a letter in October 2016 claiming the company had fixed the issue and that her credit had been restored. “But in true FedLoan Servicing style,” she told me, “they only contacted two of the three credit bureaus.” It took several more months to fix her score with the third bureau, Equifax. Listen to author Ryann Liebanthal talk about how debt forgiveness can go horribly wrong on this episode of the Mother Jones Podcast. If not for FedLoan’s errors and delays, McIlvaine estimates, her loans would be eligible for forgiveness as soon as 2020. But instead, in the nine years she’s been participating in PSLF, months of payments haven’t been counted toward her 10-year requirement, ultimately delaying the date of her forgiveness by at least a year. All the while, although she’s been making payments of between $300 and $450 a month, her total debt has not gone down. After nearly 100 payments, she still owes the entire amount she initially borrowed. FedLoan declined to comment on McIlvaine’s tribulations. But as complaints to the Consumer Financial Protection Bureau and lawsuits against the Education Department and FedLoan pile up, she’s hardly alone. In 2017, the bureau issued a report excoriating FedLoan for mismanaging PSLF, misleading borrowers, and losing track of payments. 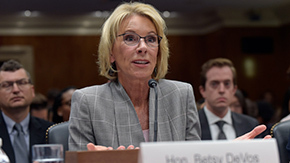 The previous year, the American Bar Association had filed suit against the Education Department for reneging on its own rules about how the program was supposed to work and who was eligible for forgiveness. Then, in August 2017, Massachusetts Attorney General Maura Healey sued FedLoan on behalf of the state’s borrowers, alleging it had overcharged them and bilked them out of payments. And just this January, a set of borrowers filed a class-action suit against the company for repeatedly putting them into needless forbearances that delayed their forgiveness. A decade after McIlvaine and scores of others began paying into the program, many are only barely closer to their goal of being debt-free. And some are even more in debt than when they started. Now, the Trump administration has begun disassembling one of the only checks on companies like FedLoan, the Consumer Financial Protection Bureau, all while arguing that these companies are off-limits to state attorneys general like Healey—essentially trying to give them legal protection. 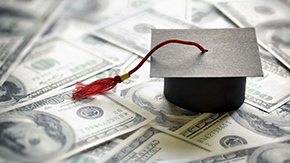 Meanwhile, in early June, Republican legislators were trying to find votes for a sweeping and massively unpopular higher-education bill called PROSPER that would get rid of many grant programs as well as loan subsidies and PSLF. Trump’s 2018 and 2019 budgets also proposed axing the PSLF program. Congress has so far rejected the idea, but if the efforts succeed they would remove what was a very small sliver of hope for a generation underwater. October 2017 should have been a moment for celebration for those sunk by debt—it was the first time a cohort of PSLF participants, after 10 years of payments, could be forgiven. Yet of almost 900,000 people who have submitted at least one payment to the PSLF program and FedLoan since 2012, the Education Department expects fewer than 1,000 to be forgiven by the end of its fiscal year. The reasons for these astonishingly dismal statistics are myriad, but one fact is clear: A decade after McIlvaine and scores of others began paying into the program, many are only barely closer to their goal of being debt-free. And some are even more in debt than when they started. Today, FedLoan services about a third of all federal student debt, and last year the company took home $195 million from the Education Department. But for years, there were reasons to doubt the company’s competency to administer such a large portion of the government’s loan portfolio. But Johnson’s student aid program immediately fell short of his lofty aims. Over the next four decades, it shifted from a model relying on tax dollars to provide a public good into a loan-centered system that viewed education as a “private responsibility and risk”—and student borrowers as sources of profit, says Deanne Loonin, an author and attorney at the Legal Services Center of Harvard Law School. Johnson had wanted to create a national scholarship fund for students—like a universal GI Bill—but Congress told him it would be too expensive. So he struck a compromise with Republicans: He would supplement federal funds with loans doled out by private banks, which in turn would receive subsidies from the government, ensuring they would get their money back if a borrower skipped out on the debt. To shore up its insurance program, the feds partnered with dozens of nonprofits and state agencies, including PHEAA. The government would pay out 1 percent of each loan an agency managed. And if borrowers did stop paying, PHEAA and the other institutions would reimburse the lending bank and then act as collection agencies—pocketing collection fees to the tune of 16 cents on the dollar. Meanwhile, as demand for higher education grew, so did college costs, while incomes didn’t keep pace. So in 1972, President Richard Nixon did two things: He expanded a federally funded grant program for low-income students, which became known as the Pell Grant, and he created an entity called Sallie Mae that used Treasury funds to buy up student loans from banks. By the early 1990s, the issue of student debt was already notable enough for Bill Clinton to campaign on it. His vision was to allow students to pay back their loans by doing national service. But Republican pushback forced Clinton to settle for expanding a George H.W. Bush pilot program called Federal Direct Loan Demonstration, better known as Direct Loans, which allowed the government to make loans to students, cutting out the costly middlemen—the banks and guarantee agencies like PHEAA. Direct Loan borrowers were allowed to base their payments on their incomes, and to have their debts forgiven after 25 years. Eventually, Clinton planned, every new student loan would be a Direct Loan. This proved to be a consequential moment for the American student debt crisis. Around this time, some guarantee agencies, perhaps panicked about their cash flow drying up if Clinton’s plan succeeded, took on what Bob Shireman, a major figure in the campaign for Direct Loans, calls “a business venture mentality.” The biggest player was Sallie Mae: By the time it became independent of the federal government in 2004, it was making profits of almost $2 billion a year, selling loans in bundles on Wall Street, and giving out private loans outside the federal system at rates of more than 20 percent in some cases. It was also gobbling up state loan agencies. In 2004, Sallie Mae even made an aggressive but unsuccessful bid to buy PHEAA. More than a decade after their creation, Direct Loans still only made up 25 percent of all student loans. Meanwhile, the Pell Grant was losing value. And as states reduced investments in higher education, hitting a 25-year nadir in 2011, public colleges covered the difference by raising tuitions. For the middleman organizations like PHEAA, this shift was poised to take a big chunk out of their revenue streams. To soften the blow, the Education Department offered an appeasement. As a result, by the early years of the 21st century, many millions more young people were heading to college—the realization of LBJ’s dream—but they were taking on monumental yokes of debt. Outrage over student loan debt powered Sen. Bernie Sanders’ upstart campaign for president. And the reason the issue so motivated young people wasn’t hard to understand: For the 2017-18 school year, according to the College Board, students at public universities were charged an average of about $21,000 for tuition, room, and board—more than twice the cost, adjusted for inflation, that they had paid three decades earlier. At private schools, those fees totaled almost $47,000, versus about $22,500 in 1987. In 2015, more than two-thirds of college graduates had loan debt—$30,100 on average. Nearly a quarter of borrowers with postgraduate degrees owed more than $100,000. And according to Student Debt Crisis, a borrower advocacy organization, this year the total amount of outstanding student loan debt topped $1.5 trillion. Add to the equation decades of widening income inequality and wage stagnation—for young college graduates, wages fell overall between 2000 and 2012—and you have a situation ripe for lenders to pull in enormous profits from students who, to compete, have had to saddle themselves with debt to get a decent-paying job. Not everyone was for it, though. Repub­lican detractors likened the bill to socialism and called it a move away from “personal responsibility.” In order to get them to sign on, Kennedy and his co-sponsors had to compromise. The solution they came up with? The bill would pay for itself by offsetting $42 billion over 10 years largely by repealing subsidies that went to banks such as Bank of America, Wells Fargo, and Chase. The banks weren’t happy about this, but by 2007 they’d been raking it in for years, and even with reduced rations, they could still expect to turn a tidy profit. Then came 2008, the crisis, and the bailout—but not the one you’ve heard about: the student loan bailout. Only a few months after the creation of PSLF, it became clear the banks were out of money. And with no money, there could be no new student loans. As David Bergeron, then a director of policy and budget development at the Education Department, told me, that would have meant that “every tuition-dependent college and university in the United States would close” that fall. So the Education Department, beginning in the waning days of the Bush administration, bought up more than $110 billion in loans from private banks, in some instances paying the loan balance plus $75 per loan. Obama picked up where Bush had left off, effectively nationalizing the student loan system. By July 1, 2010, Clinton’s old dream was finally realized: All new federal loans were made under the Direct Loan program. For the middleman organizations like PHEAA, this shift was poised to take a big chunk out of their revenue streams. To soften the blow—and amid a ton of lobbying—the Education Department offered an appeasement. It would contract out the day-to-day work of collecting payments, managing accounts, and helping borrowers sort through their options—all the “service” that goes into loan collection—to four of the largest of these organizations. Even before it created FedLoan, there was plenty of reason to believe that PHEAA’s priorities were askew. In 2007, investigations by news outlets, including the Patriot-News, based near PHEAA’s Harrisburg headquarters, revealed the agency had given out $2.5 million in bonuses to executives that year and had spent almost $1 million between 2000 and 2005 on board retreats that included $150 cigars and falconry lessons. Then-CEO Richard Willey made nearly $500,000 in 2007: His $181,000 bonus that year was more than the governor’s salary. Amid this criticism, Willey resigned. PHEAA’s actions also harm individual borrowers. In early 2013, Lee Pele, a 27-year-old man from Fairfax County, Virginia, called to ask why defaulted student loans he’d never taken out were showing up on his credit report. PHEAA had no answer. Soon he was being hounded by a collection agency for more than $137,000. He sued. PHEAA argued that, as an arm of the state, it had sovereign immunity. Oberg’s whistleblower suit, which fought similar immunity claims, wound its way up to the Supreme Court, which last year upheld a lower court’s ruling that PHEAA, financially independent and conducting business nationally, could be held responsible for its malfeasance. Shortly thereafter, the company settled with Pele. Oberg’s lawsuit also shined a light on the pipeline between PHEAA and the federal government. For instance, the Education Department’s assistant secretary in charge of postsecondary education was Sally Stroup, who had previously spent more than a decade as PHEAA’s chief counsel. In January, Betsy DeVos named Kathleen Smith, another PHEAA executive, to be deputy chief operating officer at Federal Student Aid. Her predecessor in the Obama administration was Matthew Sessa, also from PHEAA, who led its bid to win the PSLF contract. I found Brandon Isaacs on a Facebook page called “FedLoan Servicing Complaints,” where more than 180 reviewers have collectively given the company a 1.2-star rating and narrate a mind-numbing array of customer service nightmares. “If I could give negative stars I would,” wrote one woman last September. “FedLoan Servicing is the worst company ever!” Isaacs wrote in May 2017. He complained it had failed to count several of his payments: “I work for the federal government. It should be easy.” His post netted dozens of responses. Isaacs lives in a Philadelphia suburb and works as a lawyer for a government agency, writing decisions for judges in response to requests for benefits. Before this, he worked for six years as a claims processor at the Labor Department. He graduated from the University of Detroit Mercy in 2009, when, on the slow upswing out of the recession, there were few private-sector options. He had federal loans, about $139,000 worth, consolidated into an income-based plan, and he knew he would want to take advantage of PSLF. I visited him, following the Schuylkill River via SEPTA train as it traveled north and west from Philly, city buildings becoming flat row houses and apartment complexes and then single-family homes sporting covered boats trackside. The streets in Conshohocken were quiet, clean. Although he lives, by his own account, a good life, and says his payments are reasonable (they’re now about $800 a month), Isaacs finds interacting with FedLoan to be almost unendurable. “There’s nothing that goes right,” he said. Over the years, Isaacs has requested a few forbearances, including for a couple of months in late 2012 when he needed money for a down payment. But otherwise he has made on-time payments since 2010 and always stayed on top of sending his income information and tracking his progress. Yet FedLoan’s records claim that Isaacs was in forbearance over several other periods, so even though he made full payments during that time, the company took months to correct the error and only recently counted them toward his forgiveness. For Isaacs, the general lack of transparency has caused constant uncertainty. His payment count seems to fluctuate illogically with every employment recertification, and representatives have occasionally delivered wildly disparate information about his account. During one phone call, Isaacs says a representative underreported the number of payments he’d made by nearly 50. Isaacs panicked: That would mean FedLoan was delaying his forgiveness by more than four years, and if it could make a mistake like this, even over the phone, how could he trust anything the company told him? Others describe even worse experiences of confusion and betrayal. Not long after graduating from law school in Colorado, Michelle Quintero-Millan moved to South Texas, bought a car, and began working as a children’s staff attorney at the American Bar Association’s Pro Bono Asylum Representation Project (ProBAR). She would drive through the desert, visiting unaccompanied minors picked up by Border Patrol and held at federal migrant shelters, explaining what was going to happen to them and occasionally representing them in court. The Education Department, led by Betsy DeVos, argues that FedLoan, as a contractor, was never qualified to make those initial authorizations. Further, the department insists, the only way a borrower can confirm enrollment in PSLF is by being forgiven. However Kafkaesque, this last argument actually appears to represent the approach the Education Department has taken consistently. Until 2012, after Bob Shireman, the student loan expert in the Clinton and Obama administrations, “begged” the department “to create a process to tell people whether they’re in public service employment or not,” there wasn’t even a form you could fill out to find out if you were on the right track. 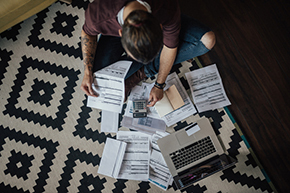 “There’s a number of borrowers in a constant state of anxiety,” Adam Minsky, a Boston-based lawyer who specializes in student loan issues, told me. And for borrowers, there’s no sense that anyone in charge of the program cares. An FAQ on the Education Department’s PSLF website offers little reassurance. “Can I be certain that the PSLF Program will exist by the time I have made my 120 qualifying payments?” it asks. “We can’t make any guarantees,” the site responds. Rudert, the former Vietnam Veterans of America employee, has seen his debt increase. Now he wonders if PSLF is still worth it, or even something he can rely on, in spite of all the time he’s put in. “I would say my entire life was kind of influenced by these decisions,” he says. In addition to servicer errors and poor customer service, PSLF borrowers face an incredibly arcane program full of false pathways and bad information. For instance, there’s a Standard Repayment Plan and a 10-Year Standard Repayment Plan and only one of them qualifies for PSLF. And many borrowers have reported being misled by servicers about the plan they’re on, making functionally worthless payments for years. Last year, I visited Leigh McIlvaine in Portland, where, coincidentally, I had lived while going to Reed College. Full disclosure: I, too, was once a PSLF participant. I had more than $20,000 in debt from Reed and many tens of thousands more from grad school. After I submitted my first form from my nonprofit job to FedLoan, the company failed to tell me it had begun counting the extra loan payments I made each month against me. Instead of using the money to pay down my loans, it was using it to push forward my due date and consider all my intervening payments nonqualifying. That’s what first sent me searching for answers about why the program is such a mess. Eventually, I quit my nonprofit job, and I’ve basically given up on ever qualifying for forgiveness. The day I visited McIlvaine, it was an unusually cold, clear morning that afforded a striking view of Mount Hood, the rare gem on Portland’s eastern horizon. McIlvaine showed me around her office and introduced me to colleagues, several of whom were also working toward loan forgiveness. Her time was limited—later that day she’d prepare to hand over her responsibilities for the next three months: Her first child was due on Christmas Day. In an ideal world, she told me, she would have delivered herself from debt before the baby came and she and her husband had to begin paying $1,300 a month in child care costs. But she was 37, so there wasn’t really time for that. That night in Portland, I walked to McIlvaine’s modest, single-level home. Having recently finished decorating the baby’s nursery, lined with plants and freshly painted, McIlvaine and her husband were now turning their attention to the kitchen, in a mild state of midconstruction disarray. McIlvaine showed me the single-rack countertop dishwasher her mom had just gifted them to help with bottle washing. McIlvaine is overjoyed at having a child and reaching a place where she feels ready to take on that responsibility. At the same time, her experience with student debt has deeply changed not just the way she thinks about her own life, but also the way she thinks of the lives of her son and any future kids. She told me dryly that she wasn’t sure she’d encourage them to go to college but would urge them instead to “become a carpenter—and they can rebuild American cities that have been devastated.” When I asked her if she felt any stigma about her debt, she said no. “The right choices were too expensive for the economy that I live in today.” By the time she reaches forgiveness, if she ever does, she estimates she’ll have paid about $60,000—nearly as much as she borrowed in the first place—and she feels okay about that. Charts by Olivia Exstrum; interactive by Julia Smith, Adam Vieyra, and Rowan Walrath.